Smooth muscle myosin heavy chain (SM-MHC) is a cytoplasmic structural protein, which is a major component of the contractile apparatus in smooth muscle cells. 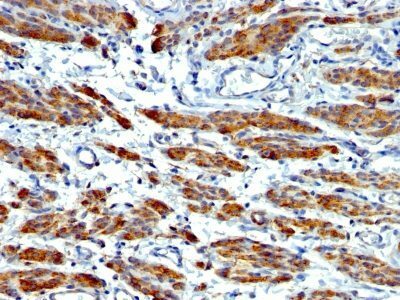 Smooth muscle myosin heavy chain (SM-MHC) is a cytoplasmic structural protein, which is a major component of the contractile apparatus in smooth muscle cells. 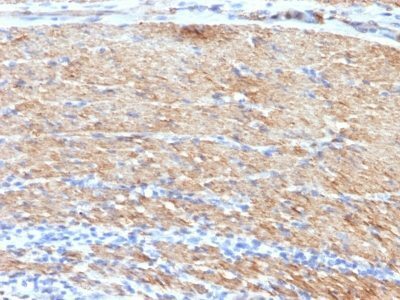 Expression of smooth muscle myosin is developmentally regulated, appearing early in smooth muscle development, and is specific for smooth muscle development. Two isoforms of smooth muscle myosin heavy chain have been identified, designated MHC-1 and MHC-2. 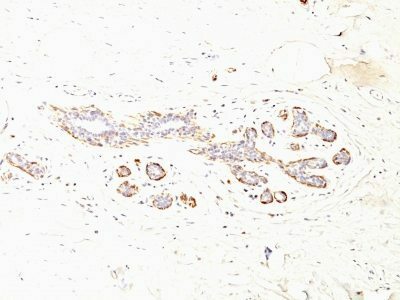 The antibody may be useful for the study of breast tumors as the presence of an intact layer of myoepithelial cells is an important feature, which may distinguish benign breast lesions and carcinoma in situ from invasive tumors. 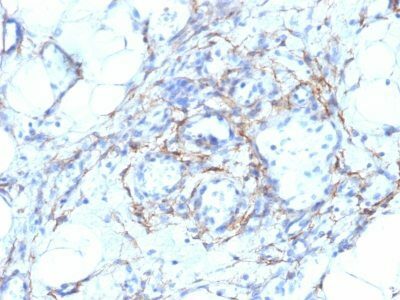 Catalog number key for antibody number 1136, Anti-Myosin, Smooth-Muscle Heavy Chain (MYH11/923 SMMS-1) The prefix indicates conjugation, followed by the antibody number and size suffix.